This is Ainsley Harriot’s version of pain perdu, French toast or eggy bread, call it what you will. They are all different names for the same breakfast indulgence. Change the fruit you serve with it as the seasons change – fried apples for the autumn, buttery bananas for winter and perhaps fresh raspberries for summer. You can use any fresh berries but when fresh berries aren’t in season you could you frozen berries or fruit compote. This version contains 3.35g of fibre per portion – but just by changing the bread you can significantly alter this. A high-fibre white bread would provide over 10g fibre per portion – that’s a third of your daily recommended target of fibre. Place the Greek yoghurt in a bowl. Roughly mash the berries in a separate bowl and then gently fold into the yoghurt to create a ripple effect. Cover with cling film and chill until needed. Beat the eggs in a shallow dish with the milk, a pinch of the cinnamon and the vanilla extract to a smooth batter. Combine the caster sugar with the remaining cinnamon in a small bowl and set aside. Heat the butter in a frying pan. Soak the brioche or country-style bread slices in the egg mixture for 2 minutes, turning once. Carefully lift into the pan and cook for 2 minutes on each side or until golden brown. 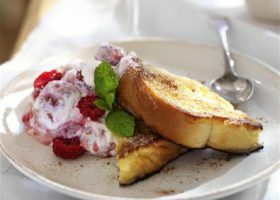 Arrange the pain perdu on warmed plates and spoon the berries yoghurt on top. Sprinkle with the cinnamon sugar to serve.